£100 per hour (from 8am to 9pm). £123 per hour (after 9pm). On overrun time that is not agreed in advance, charge per additional hour will be £240. Out of hours charges apply as we have to book additional security at a rate of £23+VAT per hour on top of the hire costs. After 10pm during weekdays and weekends, additional fees might be applied. Full Day: £600 (from 9am to 6pm). 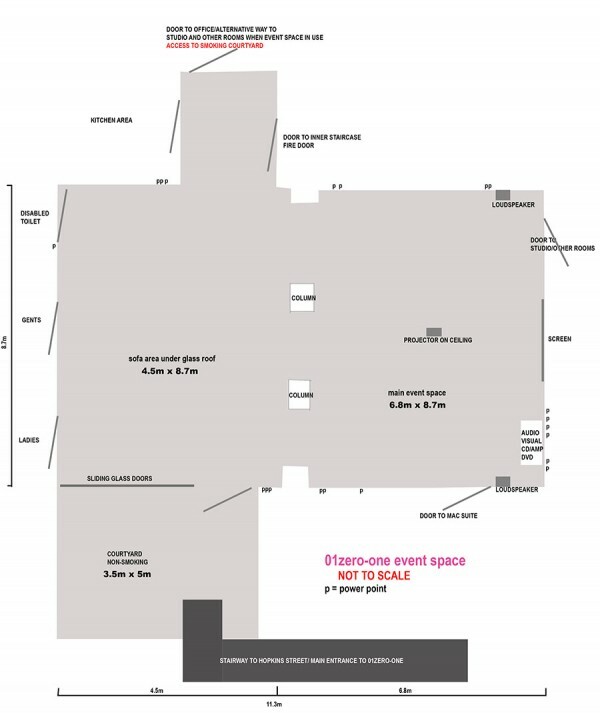 Event space hire payment and cancellation terms at 01zero-one. We are happy to make provisional bookings (pencil bookings), and these will incur no charge. To confirm your provisional booking, send an email to: studio@01zero-one.co.uk with your contact details and an address for us to send our invoice to. You can also pay with credit or debit card on the phone: 02070251930. Once you have confirmed your booking, we will send you a confirmation email and require full payment for the studio. This payment is non refundable. If you cancel a confirmed studio booking, you will still be charged the full amount of the hire. For more info, please contact: studio@01zero-one.co.uk or 020 7025 1988 / 07944 833 256.